As we prepare to embark on our second journey to Ireland, Nancy and I know that many will be following along back home through the wonders of social media. We will post pictures and updates when we come across a network but if we can't connect.....trust me, we're having a pint for you!! 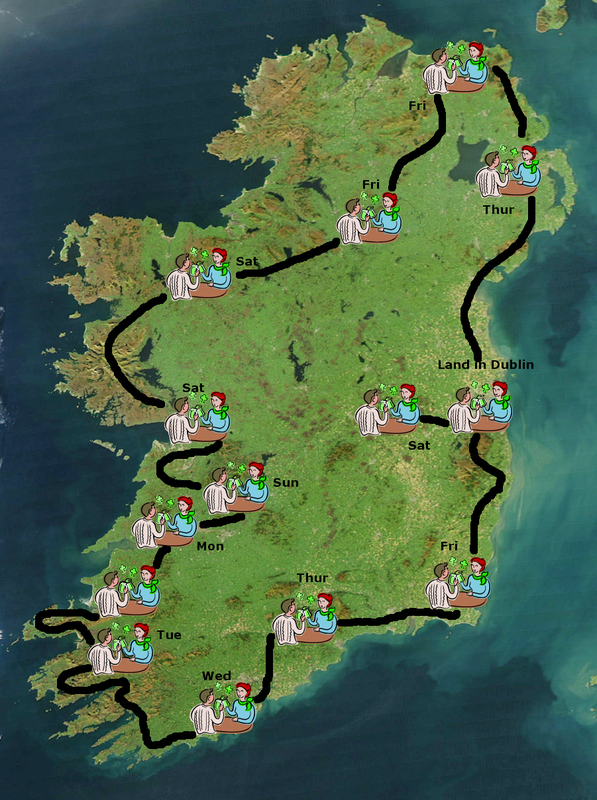 It is another whirl-wind tour taking in Giant's Causeway, a boat trip to Nancy's Point, the Crab Festival in Galway, the Listowel Racing Festival, Fungie the Dingle Dolphin, the Ring of Kerry, the Rock of Cashel, Waterford, Wexford, Wicklow, and of course, Mooney's Pub in Monasterevan. Some visits to Bushmill's Tullamore Dew, Guinness, and perhaps a few pubs along the way. Here's our map if you want to follow along..... Slainte!